Yahoo get into Logo Play for More emphasis on Search? Yahoo homepage went for a little makeover. Yahoo logo has moved from top-left position to top-center (screaming!) position. So, what hits your eyes when you open yahoo.com? Besides the ever so familiar YAHOO logo, it’s “in-your-face” Yahoo search bar and search option. Close examination reveal nothing exciting. Besides the logo re-arrangement nothing has changed on Yahoo homepage. 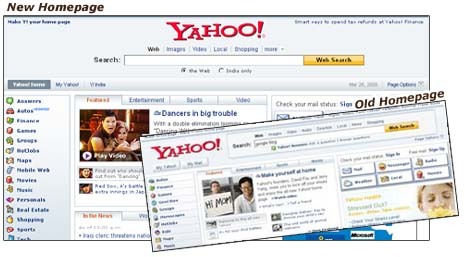 Here is how old and new Yahoo homepages look. Related – Have a look at Google Homepage over the Years!